Duke University basketball coach Mike Krzyzewski, or Coach K, is one of the greatest coaches in college sports history. His Blue Devils teams have won five national championships. He has been to the Final Four 12 times. He has led the USA Basketball team to Olympic gold medals three times. How Mike Krzyzewski motivated his players to win that first Olympic gold medal in 2008 offers an important lesson about motivation and goals that we can use in our lives and work. The USA basketball team was in trouble when Coach K was hired to lead it. They had only won the bronze medal at the 2004 Olympics despite having arguably the best players in the world. Krzyzewski was determined to help the U.S. team win gold in Beijing in 2008. He knew that even though he had some of the best players to ever play the game on his team in 2008 – players like LeBron James, Kobe Bryant, and Dwyane Wade – they had to learn the international game and come together as a team to achieve their goal. Coach K handed each of his players a notebook as training for the Olympics began. On the first page of each player’s notebook was a large image of an Olympic gold medal. At every team meeting, the screen of TV monitors on the wall displayed an Olympic gold medal. Coach K wanted his players to see what their goal was every time they got together. They thought about winning gold at every practice and in every meeting. He wanted his players to visualize and truly understand why they were there. 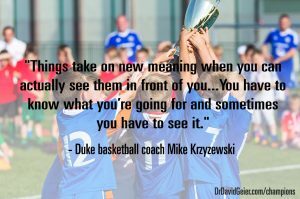 In the video above, I discuss how you can use visual imagery like that of Mike Krzyzewski and USA Basketball to motivate yourself to achieve goals and become a champion in every aspect of your life.